These 5 strategies will help you make meaningful connections with others. Remember how easy it was to make friends when you were a kid? You'd pick a classmate to share some crayons with and before you knew it, you were buddies. Play dates were coordinated courtesy of your parents, transportation included. Not to mention, save for school and soccer practice, your calendar was wide open for bonding time. 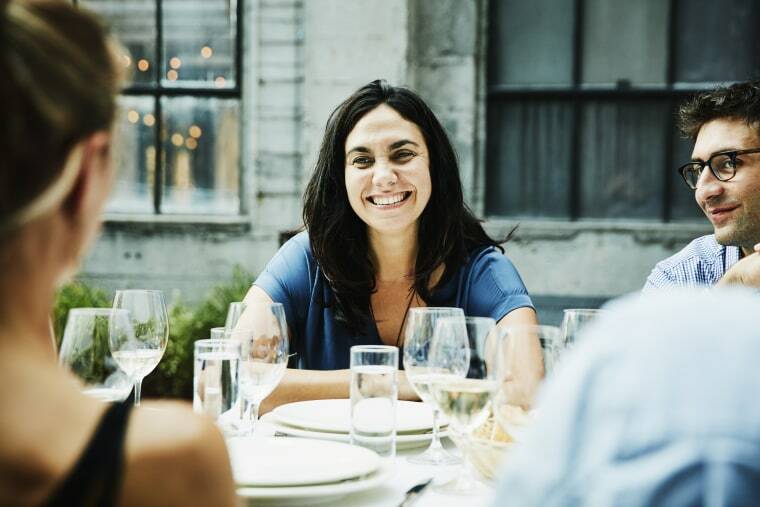 Believe it or not, the opportunities to make friends don’t necessarily become more scarce as we enter adulthood — it’s our mindset that has changed. As a child, when the opportunity arose to make a new acquaintance, you weren't worried about being rejected. "During childhood, the part of our brain (prefrontal cortex) which provides executive functioning ability like judgment, planning and personality is not fully developed," explains Dr. Kate Cummins, a licensed clinical psychologist in California. "As we age, we get more into our heads about the judgment of another person, or the thoughts they may have about us." Regardless of your age or marital status, there is plenty of science to support the importance of seeking and maintaining friendships. A study published in the British Medical Journal found that men and women who reported having 10 or more friendships at age 45 had significantly higher levels of psychological well-being at age 50 than those with fewer friends. Maintaining friendships may even be more important as we get age, according to researchers at Michigan State University who found that among older adults, friendship quality often predicts health more so than the quality of any other relationship. Among older adults, friendship quality often predicts health more so than the quality of any other relationship. Another study conducted by researchers at Brigham Young University went as far as to say that friendships affect our life expectancy: people with larger social circles had a 50 percent lower mortality risk than those who didn't. Translation: You should be cultivating friendships like your life depends on it. So if your social circles have started to dwindle, here's what you can do to start adding some more friends to your roster. A recent Gallup poll found that women who have a best friend at work are more engaged employees. You don't have a classroom full of peers to choose from, but there are plenty of places you find yourself as an adult where you’re surrounded by like-minded people to befriend. You can start by scoping out your office for a new pal — which can also be beneficial to your job. A recent Gallup poll found that women who have a best friend at work are more engaged employees. Seeking out peer groups that align with your interests can help expose new friendship opportunities as well. Julie Katz-Shapiro, 45, a New York-based mom of two, made friends through a new mother's group after having her first child. "I hesitantly joined a mom’s group in Queens because I was the only one of my friends who had a baby," she says. "I found the most wonderful women — all with babies the exact same age as mine, and we basically learned how to be mothers together. Two of them are still my very close friends." Put yourself in an environment where there are people you could potentially connect with over similar interests. “Whether this is a mastermind group, recreational [sports] leagues, weekly Zumba classes, a night class at a local community college, an REI training class, a MeetUp … put yourself in situations where you’ll meet multiple new people face to face,” says Annie Wright, licensed psychotherapist in California. Cummins says choosing someone who you share some common ground with makes for a good potential friend, as it gives you something to bond over. Taking a look at where you feel that void can also help pinpoint new candidates. Is it someone to grab a post-workout smoothie with? Put the woman you do partner planks with at gym class on your list. Need a date to try out that nearby wine bar? Ask the coworker who just got back from wine country. “After making a list of people, [my clients] are often assigned to text one person a week to set up a friend coffee date or walk,” says Cummins. No, we don’t mean finding chatrooms to make “virtual” friends. But you can utilize social media to make connections IRL. "Find and follow your kindred spirits on social media," suggests Wright. "Connecting and following someone online may not bloom into a real friendship right away, but this may happen over time if you two decide to take it offline." This may even be someone you're already connected to. "After the 2016 election I was pretty bitter and started reevaluating my friendships," says Ayana King, 38, a communication manager in Michigan. "Someone from my old congregation began to comment on my Facebook posts, and we started chatting. We made plans and met up for dinner and cocktails one night. Nearly two years later we still meet regularly, usually once a month for dinner and drinks — and we bring our husbands!" Our number of friendships decreases as we get older — starting around age 25. When it comes to making friends as an adult, we're up against a time deficit. Add in a schedule full of responsibilities and the painful logistics of coordinating with someone else's schedule and preferences, and it's no surprise that our number of friendships decreases as we get older — starting around age 25, according to a study published in the Royal Society Open Science. As Wright explains, putting time on your calendar for friendship holds us accountable. “Even if you have to reschedule or postpone an event on your calendar, the mere act of having it on there can create a sense of unconscious pressure or motivation to see it through,” she says. “Put a friendship date — whether with an old friend or a new one — down in your calendar and stick to it. Don’t let schedules keep you from prioritizing this if making friends is, in fact, a priority for you."